PHUKET, the pearl of Andaman , never fails to make a lasting impression on its visitors with the perfect natural beauty and all the conveniences for those who truly seek a quite rest.This impressive surrounding is easily accessible either by road , air or ferry. 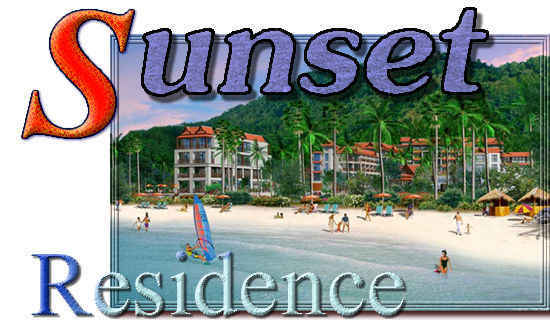 Sunset Residence has a prime location at Kalim Beach within easy walking distance of Patong Beach a well-known international resort. 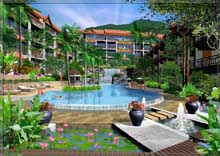 It is a perfect blend of exquisite Thai and Western style architecture completed to our own high standards. Set in a quiet location surrounded by nature you can appreciate the magnificent views of the sunset and the enchanting sounds of the ocean. Experience the simple and peaceful life at….Sunset Residence on Phuket Island. It offers you a residence amidst the resourcefulness of natural resource and the availability of all the conveniences offers by the Project that creats an atmosphere that is complete with an idyllic surrounding of plant species. At night, the waves make the natural music that lulls you to your sweet slumber, and during the day, the mood changes to the pleasing sound of waterfall that is only at your arm's length. With the perfect combination in the proximity of nature, today…Sunset Residence is ready to be the perfect home of your dream. The quality project by phuket property developer - Sinsiam Union Development Co.,Ltd. This project constucted completely. Just 2 units available!!! Copyright © 2000 - 2001 . All rights reserved.